When cut, the sweet fragrance of chili pepper and paprika can be perceived, combined with the scent of the small deli artisan shops and balsamic notes. The taste opens sweet and the gradually improves and closes with strong spicy hints, still not invasive. A dry Italian sausage made in the traditional manner for this salami with an oblong and flattened shape. 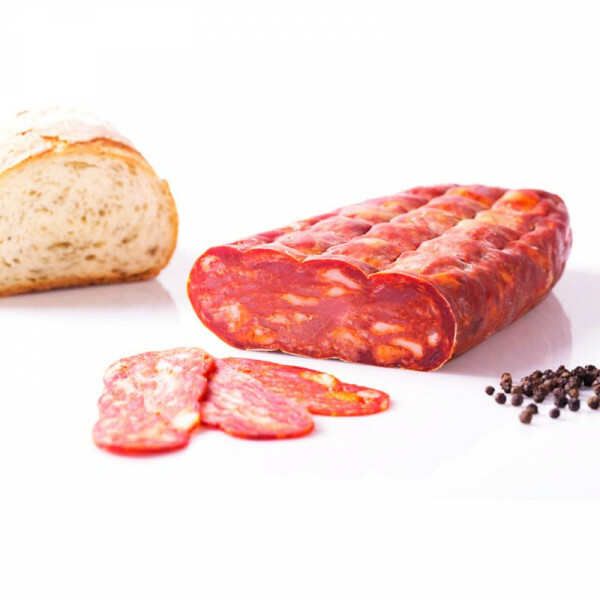 Schiacciata salami may be seasoned with sweet ingredients or spicy ingredients to provide a sweet mellow flavour or a "piccante" spiced taste. The raw material used is the typical local pork thigh, minced with or without flavourings and characterized by a spicy flavour. Looking at the slice, the low-fat and fat parts, cut with the knife, can be clearly distinguished. The colour tends to brick red and the shape is typically flattened. Pork meat, salt, pepper (sweet or chilli), preservatives E252, E300, spieces, natural flavours. LACTOSE-FREE, GLUTEN-FREE.